Abstract. The evolution of heathlands during the Holocene has been registered in various soil records. Paleoecological analyses of these records enable reconstruction of the changing economic and cultural management of heaths and the consequences for landscape and soils. Heaths are characteristic components of cultural landscape mosaics on sandy soils in the Netherlands. The natural habitat of heather species was moorland. At first, natural events like forest fires and storms caused small-scale forest degradation; in addition on that, the forest degradation accelerated due to cultural activities like forest grazing, wood cutting, and shifting cultivation. Heather plants invaded degraded forest soils, and heaths developed. People learned to use the heaths for economic and cultural purposes. The impact of the heath management on landscape and soils was registered in soil records of barrows, drift sand sequences, and plaggic Anthrosols. Based on pollen diagrams of such records we could reconstruct that heaths were developed and used for cattle grazing before the Bronze Age. During the late Neolithic, the Bronze Age, and Iron Age, people created the barrow landscape on the ancestral heaths. After the Iron Age, people probably continued with cattle grazing on the heaths and plaggic agriculture until the early Middle Ages. Severe forest degradation by the production of charcoal for melting iron during the Iron Age till the 6th–7th century and during the 11th–13th century for the trade of wood resulted in extensive sand drifting, a threat to the valuable heaths. The introduction of the deep, stable economy and heath sods digging in the course of the 18th century resulted in acceleration of the rise of plaggic horizons, severe heath degradation, and again extension of sand drifting. At the end of the 19th century heath lost its economic value due to the introduction of chemical fertilizers. The heaths were transformed into "new" arable fields and forests, and due to deep ploughing most soil archives were destroyed. Since AD1980, the remaining relicts of the ancestral heaths are preserved and restored in the frame of the programs to improve the regional and national geo-biodiversity. Despite the realization of many heath restoration projects during the last decades, the area of the present heaths is just a fraction of the heath areal in AD1900. 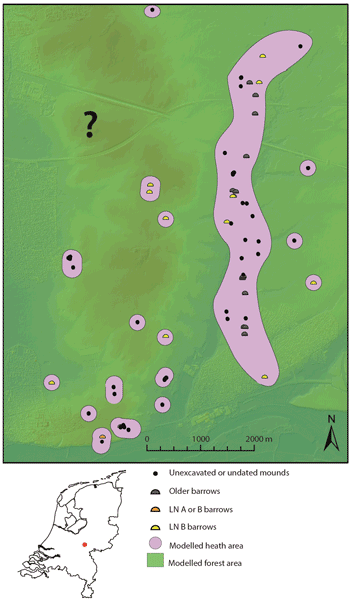 How to cite: Doorenbosch, M. and van Mourik, J. M.: The impact of ancestral heath management on soils and landscapes: a reconstruction based on paleoecological analyses of soil records in the central and southeastern Netherlands, SOIL, 2, 311-324, https://doi.org/10.5194/soil-2-311-2016, 2016.